Paul Krugman notes that public sector employment has declined under Obama—a sharp contrast with his two predecessors, under whom it grew (with Republican Bush ahead of Democrat Clinton). How does recent experience stack up on a longer view? As of March, the most recent data we have, we were 33 months into the recovery/expansion. In a “normal,” or at least average, expansion, total employment would be up 6.6% (which is why the index number on the graph is 106.6). But now it’s only up 1.8%. But there’s an enormous divergence in public and private sector employment. 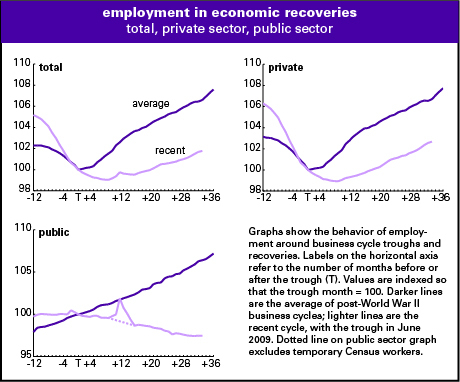 In an average recovery, private employment would be up 6.7% and the public sector up 6.4%. This time, though, the private sector is up just 2.7% (4 points short of the average)—but the public sector is down 2.5% (almost 9 points below average). Putting some numbers on that, total employment is 6.3 million below where it would be in an average recovery. (As the graph shows, the decline in employment was far deeper than average, and the recovery slower to kick in.) Of that shortfall, 4.3 million comes from the private sector, and 2.0 million from the public. So the public sector is responsible for about a third of the deficiency. But that’s twice its share of total employment. No doubt yahoos will cheer the fall in public employment as a reduction in waste—though there’s no visible payoff in private sector job growth. (Of course, the yahoos don’t care about the continued deterioration in public services.) Public sector austerity is a major drag on the job market. If public employment had merely matched the anemic growth in the private sector, the unemployment rate would be more like 7.4% than 8.2%. And if it had matched its post-World War II average, the unemployment rate would be under 7%. Propagandists love to go on about how the socialist in the White House is scaring the private sector, leading to a hiring strike. But public sector austerity—mainly at the state and local level—is a major drag on the job market. That doesn’t get anywhere the attention that it should. Very much agree. I would add that public employees also aid in private employment in two ways. First, public employee income creates additional demand, which creates customers and orders, which usually leads to hiring. Second, public employees offer a public good which can enhance the private market, and create more opportunities for trade. Austerity, on the other hand, tends to contract both the public and private spheres. As to the yahoos, how to change the dynamic? Didn’t they used to be populists? I would offer that many of them are essentially part of the military-industrial complex, and don’t view their government cheese as “government spending.” Funny how that works. Is this partly because more states now have balanced budget requirements? The global debt-money-asset macroeconomic system recovery has a summer 2012 lifetime. After that even the Uberrich Elite Republicans will (reluctantly) agree that QE- whatever it takes- is OK by them. Any job that produces something of value merits consideration. The private sector with the exception of the US military – where things like loyalty, courage, valor, looking after your mates and your country, and willing to make great personal sacrifice matter- does it better than the public sector. Why not pony up 300 billion a year for 5 years? The US dollar is ultimately denominated in a supportive work based economy. One dollar equals an amount of American or immigrant legal or otherwise sweat. Create 15M jobs giving 10 dollars an hour to the private sector which they have to match with 2 bucks. That’s a 24K a year job. With that a young person can buy an automobile; a few can pool their resources and buy a house to share … maybe a vacation. A few can even speculate in the Euro market with JP Morgan. Does public sector in clude outsourced jobs ? If i remember my demograhics right, there was a minibaby boom in the 60s or 70s, followed by an aging population. if education is 1o public, and health is often private, would that account for loss in public sector jobs ?